Why use software to plan truck loading? 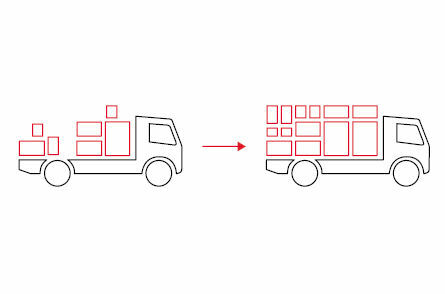 When transporting less than truckload (LTL) shipments or different container types, optimising use of loading volumes and loading sequence is crucial to remain efficient: Every run a vehicle’s loading volume is not fully utilised, is a loss of revenue. Every extra minute spent at an unloading point, is time lost. Transporting time-sensitive freight as well as fresh and frozen food products, introduces additional constraints since these goods must be delivered within a limited time. Keeping an overview of cargo loadings is difficult. Matching loading sequences with stops along routes further increases the complexity of the loading process. Why should you optimise load space with PTV xServer? The PTV xServer Load Space Optimisation API automatically and quickly solves these complex optimisation problems: You simply define the characteristics of the truck's loading space and the transport units. The system automatically delivers a loading space layout, which shows the wall distribution and the location of the individual transport units under consideration of all restrictions. Due to its standardised interface, the API perfectly integrates into other software solutions. For example, you can easily connect it with other PTV xServer components or use it as a stand-alone component with your existing system architecture. The PTV xServer Load Space Optimisation API allows you to visualise your packing plan interactively and in 3D. This way, you can view the results from all directions and angles. Choose between two packing modes to reduce either the loading meters or your packing time. With the PTV xServer Load Space Optimisation API, you can take both the allowed orientation of each item or item type and its weight carrying capacity into consideration. This way, you can make sure that your cargo is placed safely for transportation.